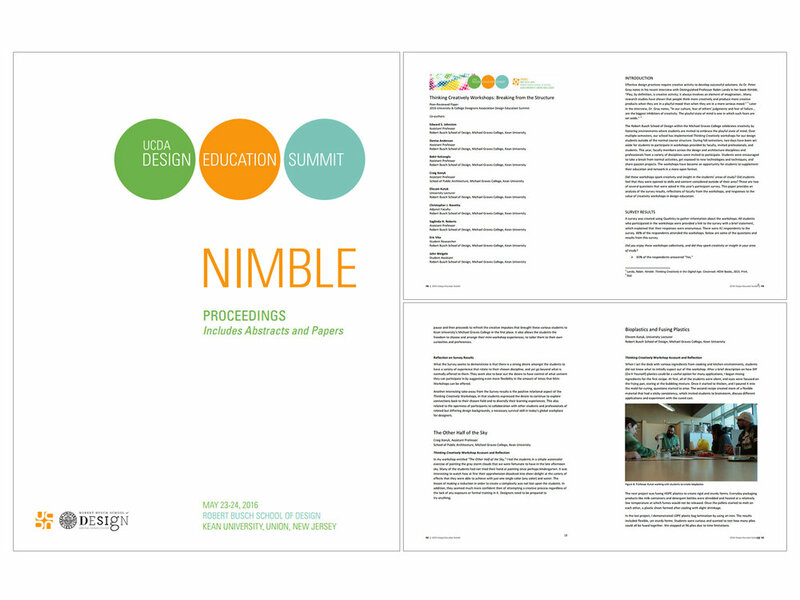 "Creativity Workshops: Breaking The Structure" is a peer reviewed paper about the workshops led by Michael Graves College faculty during Thinking Creatively week. A presentation followed by a Q&A session during UCDA Design Education Summit that hosted by Kean University. An exciting opportunity for ID seniors! Students met with the alums and professionals to talk about their portfolio. In return, they got positive feedback and had the opportunity to network for a potential internship position. Industrial Design and Occupational Therapy students worked collaboratively on a semester long project. After teams are selected, OT students brainstormed to provide a brief for the symptoms of a visionary patient to ID students. First step of ID students was empathizing the issues of the visionary patient and then finding a solution to overcome those problems by ideation, design development and testing processes. Results were brilliant, collaboration with OT will continue in following semesters. Yet another successful event organized by Michael Graves College; Thinking Creatively Charrette and Conference! This year's theme was PTSD (Post Traumatic Syndrome Disorder). Event started with a detailed info session including speakers from Gruskin Group, Psychiatrists, and a veteran who launched a non profit organization to help other veterans with PTSD. A building site development for veterans with PTSD from master plan to branding was the design brief. Efecem's team got an honorable mention. Another Industrial Design Studio is over! So many good ideas for the Housewares competition including, well thought social designs. Jobe Bobee, Designer / Artist & Adjunct Professor at Pratt Institute, joined Industrial Studio III final review as a guest critic. From Michael Graves College faculty, Craig Konyk, Assistant Professor of Architecture and Saglinda Roberts, Assistant Professor of Interior Design, participated in the review. Thanks to Jobe, Craig and Saglinda for joining the review. A demo session for Model Design course by using Smooth-On products. How to create silicone molds from positives and how to cast them with glow in the dark resin. A personal project for my office. Laser engraved leather 'Stache coasters with individual taglines. Mana Contemporary, what a great place for Michael Graves College students to visit! A ton of well accomplished artist & designer studios, amazing galleries. Highly recommended. Model Design is a course that introduces students to the shop environment. Here are a few images of the shop and work done by students. Making is FUN! Efecem Kutuk's section of the "Collaborative Design Studio" finished the Fall 2014 semester strong. Four amazing projects were presented by teams of senior students from the School of Art and Design at NJIT. Efecem Kutuk gave a lecture on furniture design to third year students in the Interior Architecture program at Cankaya University. The lecture was followed by a Q&A session and feedback on the furniture concepts. Thanks to Alper Gunduz. Efecem Kutuk was invited by Professor Hakan Yurdadogan to give a lecture on "Pop Culture in New York City" during the "History of Art and Culture" summer course offered through the Bilkent University Interior Architecture and Environmental Design program. During NYCxDESIGN week, NJIT Industrial Design Sophomore Students Malorie Pangilinan and Luz Cabrera's work "Honey I'm Home" was exhibited at Fab.com 's NYC Showroom as a result of the competition called "First Things First". A few images from the final review of the Industrial Design Specialization class. Students were asked to search for a trendy office environment and design a task light which would be a good fit for that particular space based on research about the company/office. Ufuk Keskin, Industrial Designer of Starwood Hotels and co-designer of SheetSeat, joined Industrial Studio 2 final review as a guest critic. From the faculty, Martina Decker, Assistant Professor - NJIT College of Architecture and Design, participated in the review. Thanks to Ufuk and Martina for joining and providing constructive feedback to students. 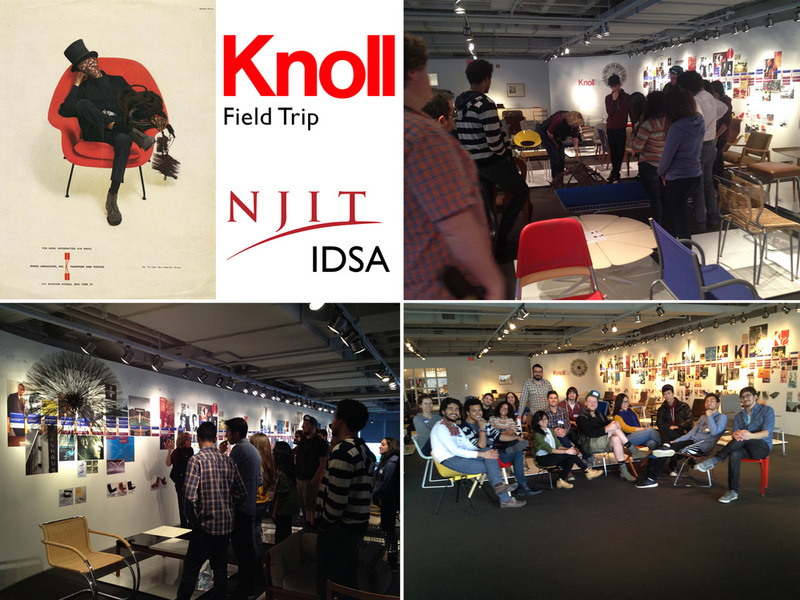 Efecem Kutuk organised a field trip to Knoll Furniture in East Greensville, PA for the Industrial Designers Society of America (IDSA) student group at NJIT. First stop was the Product Development department where a presentation was made by a senior material specialist and mechanical engineers from the company. Then a review of the history, present and future of Knoll was offered by the marketing manager, followed by a plant visit. Lastly, Linda Kasper, Museum Manager, led a tour of the museum. The day-long experience was thorough, in terms of understanding how a product goes from concept to development to final refinement to mass production, and finally marketing and exhibition. A field trip organized to Smart Design NYC for both sections of ID Studio II. First a presentation by Russell Blanchard, Associate Director of Industrial Design, who then led an office & modelling shop tour. It was an amazing experience for students to witness how a research based professional industrial design studio operates.